Bird Central - Mirrored Windowsill Feeder - Window Bird Feeders - window bird feeders, bay window feeders, in-house window bird feeders, cedar and maple construction - fun for the whole family, especially kids! View the birds feeding just outside your window. 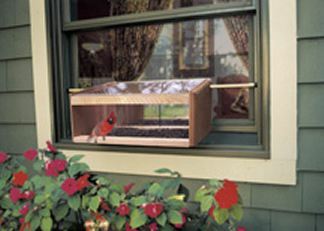 This feeder sits in the windowsill and is held in place by two spring-set wood dowels that fit securely in the screen window tracks. It measures 19 inches wide and fits a double hung window 20 to 40 inches wide. Made of mahogany, it's easy to fill and clean from inside Holds approximately 5 to 6 cups of seed. Dimensions: 19 in. x 9-1/4 in. x 8 in.